According to the traditional view, the harsh living conditions have a strong influence on people’s lives, living in the Csík Mountains. Although there is no scientific evidence for this relation, the natural environment gave several characteristics to these people, whichhelp them in their everyday life, they are succinct, purposeful and persistent. In this way they could survive for centuries and could adapt to an economically weak, uncomfortable and unsafe environment. Since the official approval of the Local Development Strategy the number of projects submitted to the Csík LEADER Local Action Group is in continous growth. Several years of attempts and documentation are backgrounding the enterprise of László Mátyás (Vãcãrești, Harghita county), which seems to be registered soon. 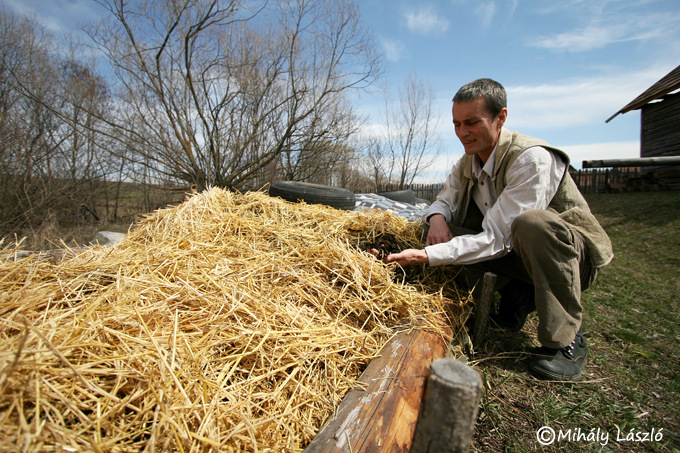 Production of worm-compost seems to be easy, but - as the entrepreneur said - every job has its own trick. The LEADER Csík Local Action group has started its activity in April 2012, after signing the 450,000€ operational cost and 2,285,000€ funding agreement with the Payment Agency for Rural Development and Fishing to implement the Rural Development Plan and to support the LEADER initiative in the region.